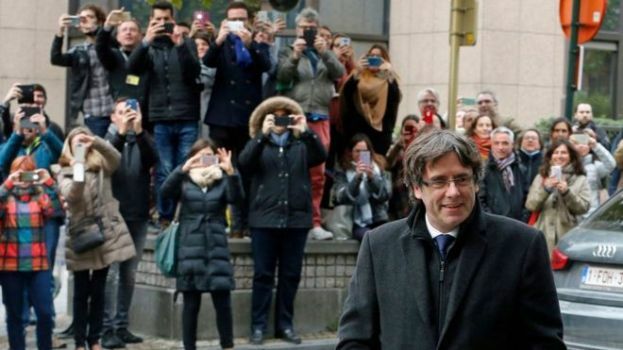 Catalonia’s deposed leader Carles Puigdemont and four former advisers have turned themselves in to Belgian police, says a prosecutors’ spokesman. He said an investigating judge would decide by Monday morning whether to execute an EU arrest warrant issued by a Spanish judge on Friday. Mr Puigdemont fled to Belgium after Madrid imposed direct rule on Catalonia following an independence referendum. He has said he will not return to Spain unless he is guaranteed a fair trial. He and his four associates are wanted on charges of rebellion, sedition, misuse of public funds, disobedience and breach of trust following the referendum which a Spanish court deemed unconstitutional. Last week, Spanish Prime Minister Mariano Rajoy imposed direct rule on Catalonia, dissolved the regional parliament and called local elections for 21 December.